Anoola DJ195 Vanilla Embroidered Dress and Cape. This stunning new outfit from one of our favourite designers, Anoola, brings a modern twist to a classic style. This dress in a butter soft crepe, features a round neckline with sleeves finishing at the elbow. There is a beautiful feather and floral embroidery to the left hand side of the skirt in soft gold and blush tones. 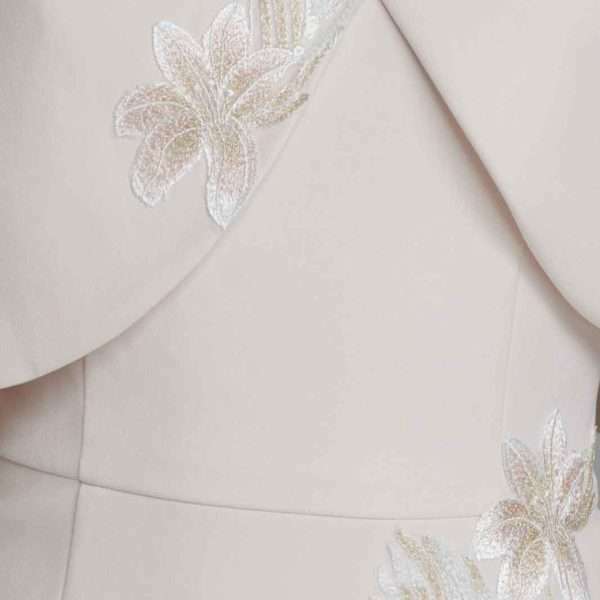 This detail is mirrored in the accompanying cape. The finishing feature of this dress is a soft fluted hemline with champagne satin lining, making this an extremely wearable style. It would be very hard not to be admired on that special day.